The ultimate treatment for pimple prone, impure skin. It treats the skin efficiently with clearly measurable results in both the lower levels of the epidermis and on the skin’s surface. Active Care contains valuable active ingredients in high concentrations such as tea tree oil, vitamin E, lecithin, zinc oxide and vitamin A. 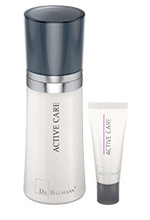 ACTIVE CARE must be applied over the entire face (and décolleté if necessary), directly onto clean skin. Regular application of this product will ensure a dramatic improvement of impure problem skin (liposome material present in the lecithin allows for a deeper penetration of the epidermis).